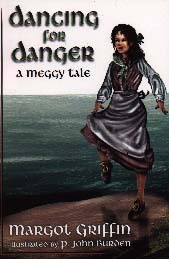 Dancing for Danger: A Meggy Tale. Margot Griffin. 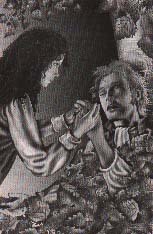 Illustrated by P. John Burden. Roddy burst through the door without so much as the twitter of a cuckoo call. "Master, Master----I'm sorry---I don't know how they got so close---the landlord's troop---it is just over the hill!" The quiet in the room changed from magic to fear. It was broken by the book falling from the master's hands, forgotten to the floor. "From which way are they comin', Roddy?" "Stay calm, children. Remember your escape plan. You can trick them by circlin' round the stand of yews out front and then hidin' in your chosen spots to the west, from where they have come. Be off with you! Godspeed." Meggy could feel the others pushing impatiently behind her. They had played Escape to the East and the West many times before, but today there were no giggles, only a few muffled cries. She gave Fiona's hand a strong squeeze and then, holding Danny in front of her, moved quickly toward the door. She tripped on something. It was the master's book, "Robin Hood." Without thinking, she shoved it in her apron pocket. Nowadays, with at least two generations of state schools in our backgrounds, we don't spend much time telling children what a privilege it is to get an education. Meggy and her small brother Danny, whose parents are Roman Catholic and tenants to an English landlord in eighteenth-century Ireland, don't need to be told. Education is illegal for them. Both students and teacher risk very severe punishment under the Penal Code if they are caught. School each day begins with a rehearsal of what to do if the lookout of the day gives a signal that the English are at hand. Mostly those signals were bird calls, but when Meggy was on guard she "danced for danger," clicking her feet on the rock in a desperate jig, unable to shout a warning for fear of bringing the landlord's men directly to the school. The alarm given, she joins the others in helping the little ones up and away from the shore where they had been studying, but when the master is shot and wounded, she breaks away to lead the enemy a merry dance, drawing him away from the spot where the master lies hidden before heading for home and assistance. Dangerous times, exciting times. Meggy's exploits should have had me on the edge of my chair, flipping pages, but somehow they didn't. Part of the problem is being asked to believe that Meggy could scoot around on hands and knees in a field of waist-high buttercups, leaving no trail for the English guard to follow. Also the language is somewhat cumbersome, although the bits of Irish slang---"amadon" and "lollygagging", for example---are fun and help set the scene as being elsewhere and "othertime." The use of "anorak" surprised me. Is it an anachronism, and therefore a mistake, or does the author know more about its linguistic origins than my dictionary for The Oxford Dictionary of Canadian English gives its origins as Greenlandic? All in all, however, Dancing for Danger is a story full of action and fun as well as danger and is an interesting introduction for children just beyond the first-chapter-book stage of reading to lives and times very different from their own. Mary Thomas has an Irish daughter-in-law who was a great help with extra and fascinating details of hedge schools. One surprising fact is that the language of instruction was nearly always English, perhaps because they had to use whatever books came to hand.